Adam Chase was the result of my desire to produce a sci-fi story in comic strip form. It actually started before Star Trek and, of course, a decade or so before Star Wars. In doing the strip on a weekly basis I would usually spend a week of spare time penciling four or five panels and the next week inking them in. It was a labor of love, not for any monetary gain. I kept tear sheets (I worked at the paper as a staff artist) and actually had the first year bound in a book, which Allan used to scan for the images you have seen. His scans were many times sharper than the original tear sheets and he deserves many kudos for doing such a great job. Unfortunately, I did save tear sheets of the second year but they have been lost or misplaced and, to my knowledge, there are none left on the planet. Allan and I discussed the possibility of running the second year using the black and white originals. Unfortunately, again, many installments in the latter part of the adventure are missing … enough that the continuity of the story, and the ending, is greatly compromised. If those missing tear sheets surface at some point in the future, perhaps Adam can reappear. For those who want to know how it all ends now, read on. Adam, Chuck and Zonn have returned to Earth with news of an impending alien invasion. World leaders are eventually warned and a battle plan and defense of the planet is devised. It is discovered that the Universors have been using our moon as a base of their own. Tor and the rest of the martian star fleet arrive and are met at a remote desert location by Adam, Chuck and Zonn, along with military leaders. The location of the Universor base is discovered and successfully attacked by the Martian star fleet. The leader of the Universors, from his distant planet elsewhere in the galaxy, warns that earth will be destroyed to gain its natural resources. (They’ve done this before). Taking the offensive, with the Martian star fleet at their command, Adam and Zonn streak across the galaxy and engage the enemy on their own turf. Unfortunately, it was a one way trip, as the only way to get rid of the Universors was to destroy their planet. Adam, Chuck and Zonn were able to sabotage their power center and destroy their world. Presumably, they lost their own lives in saving mankind, but their actual whereabouts is still unknown. ~ Wow! What a great storyline for year two and the conclusion! Russ, thanks so much for sharing Adam Chase with everyone. I'm hoping the tear sheets or originals will show up someday. Adam Chase has a mod-1960's feel to it and as a child of the 60's I felt right at home! I would second the comment, Mr. Chase, regarding thanks. I enjoyed the strip, and it is a shame that the rest of it is not available. I hope that it does turn up. Space operas, for me, never grow stale. Russell Alger Cole was born in Marysville, Kansas on September 18, 1889, according to his World War I draft card and passport application. He was the oldest of two children born to John and Mollie, as recorded in the 1900 U.S. Federal Census. They lived in Marysville where his father was register of deeds. The family was recorded in the 1905 Kansas State Census. In 1905, Cole attended the University of Kansas. In the school’s 1906 yearbook, The Jayhawker, Cole was a pledge at Sigma Alpha Epsilon. According to the Graduate Magazine, April 1922, he was in the class of 1909 but completed only one year. Cole’s father passed away before the 1910 census. Cole lived with his mother and sister on Elm Street in Marysville; his occupation was cartoonist. Cole signed his World War I draft card on June 5, 1917. His address was 3205 Grand Avenue in Des Moines, Iowa, and occupation was newspaper artist at the Des Moines Register and Tribune. His description was tall, medium build with blue eyes and light brown hair. 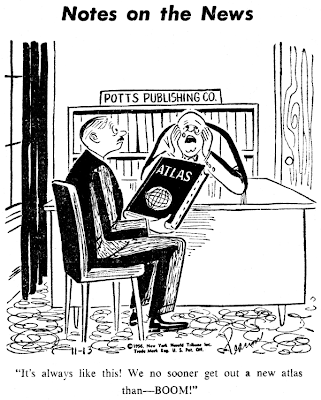 His service was reported in the Editor & Publisher, June 15, 1918, and The American Printer, July 5, 1918. Cole has not been found in the 1920 census, but his mother remained in Marysville, and his sister, Miriam, was a teacher in Des Moines. The Fourth Estate, September 3, 1921, covered the annual Des Moines Printers’ Golf tournament and said Cole was paired with a writer. The University of Kansas Graduate Magazine, April 1922, said his address was 2714 Ingersoll Avenue in Des Moines. 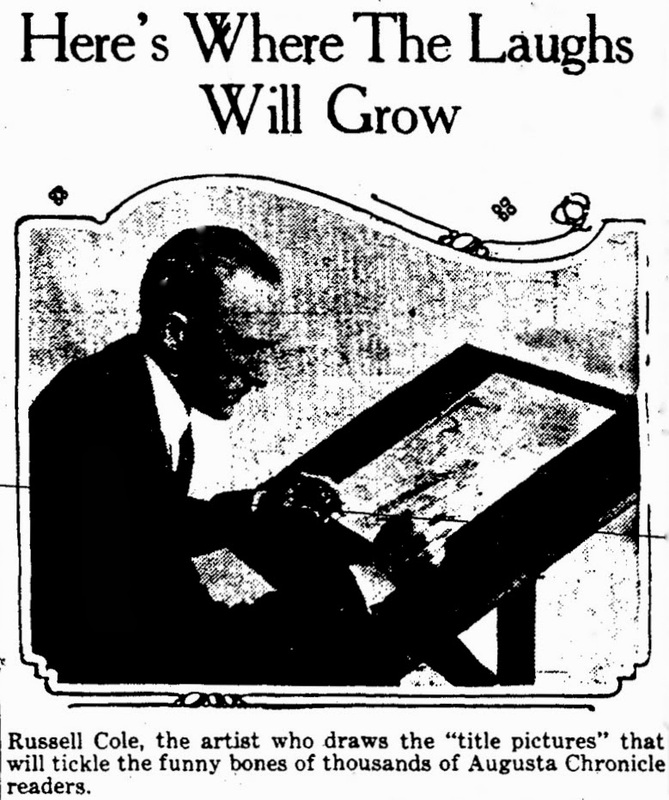 Cole’s title picture panel was syndicated as early as May 1922; he drew a picture and readers were encouraged, with prize money, to write a title for it. Cole’s passport application, at Ancestry.com, said he intended to visit England and Europe. On August 8, 1924, Cole sailed from Montreal, Canada. He returned on October 31. According to the passenger list, he lived at 722 18th Street in Des Moines. In the 1925 Iowa State Census, Cole was the head of the household which included his mother and sister. Cole’s Pippin Junction was a daily that began in 1926. The date of Cole’s move to New York City is not known. 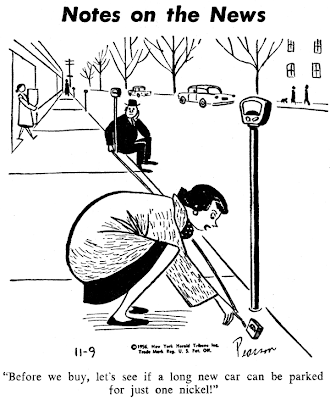 In 1929, his comic strip, Marge, was published in the New York Evening Graphic. Cole, Russell, 431 Riverside Drive, New York City. Art Department Associated Press, New York City. Cartoonist and illustrator.Lived in Iowa for a number of years and was one of the staff artists on Des Moines Register and Tribune. 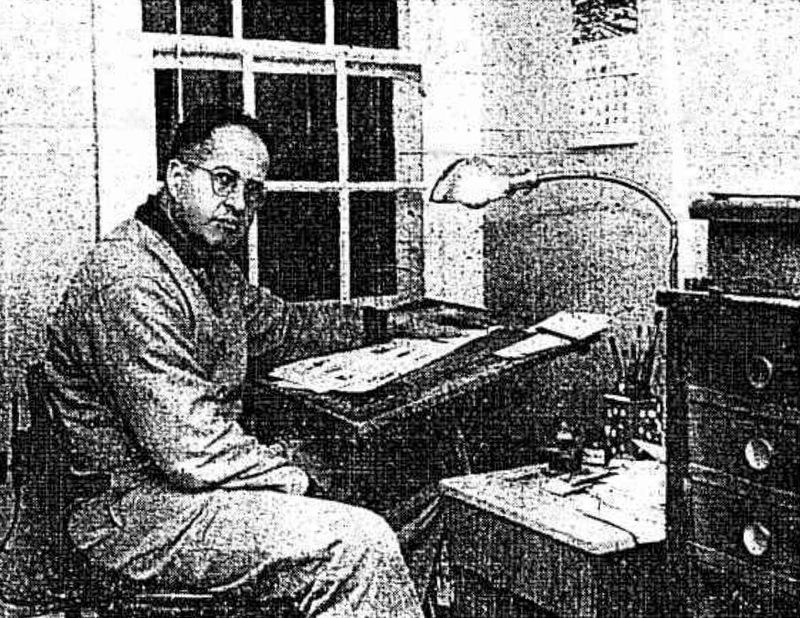 The 1940 census recorded newspaper cartoonist Cole in Manhattan, New York City, at 431 Riverside Drive, where he had been living since 1935. He shared the apartment with an insurance lawyer, an oil distributor typist, and public school teacher. Cole signed his World War II draft card on April 25, 1942, and resided at 410 Riverside Drive in Manhattan. He was five feet ten-and-a-half inches, 130 pounds, with blue eyes and brown hair. Cole, Russell Alger. Songs father sang; another Russ Cole roundup of favorites of the centuries. © Russ Cole; 11Dec61; A536489. According to the U.S. Veterans Gravesites at Ancestry.com, Cole passed away January 27, 1967, and was buried at the Fayetteville National Cemetery in Arkansas. 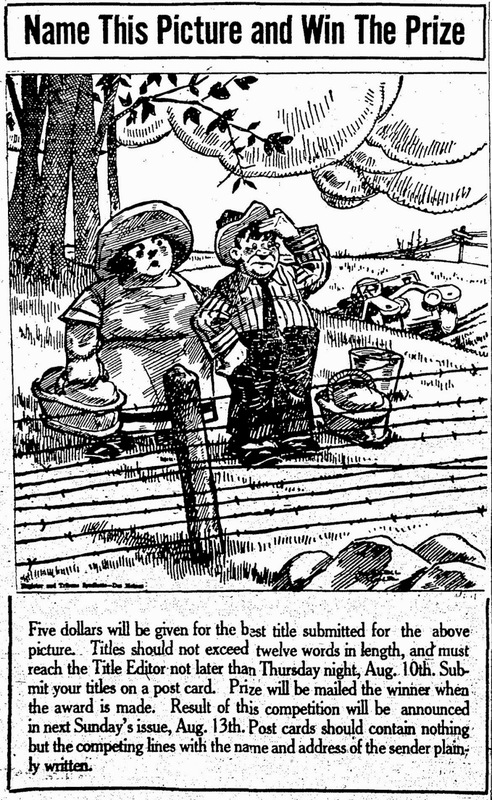 You have to give cartoonist Werner Wejp-Olsen Brownie points for selling Field Enterprises on a strip about an opera company. If there's anything the average American is more clueless about, and downright disinterested in, than opera, it doesn't come to my mind.Talk about selling ice cubes to Eskimos! As you might surmise from his chosen subject, Wejp-Olsen (who often goes by the slightly rearranged acronym 'WOW') ain't from 'round these parts; he is Danish. Despite the handicap of distance he has had good and consistent success in marketing his comic strips over here. The Maestro and Amalita is the second of at least five series he has placed with syndicates in the U.S. (the first was Granny and Slowpoke). The Maestro and Amalita, whatever its assets might have been, was doomed from the start by its subject. It is only known to have run for about five months, and that in just a few papers. Running dates in the only place I've found it, the Detroit News, were October 30 1978 to March 3 1979. Ohio State University apparently has the original art to a Sunday dated April 2 1979, so perhaps somewhere it ran a bit longer. The Torrance Daily Breeze ran this strip from Jan. 1, 1979 to April 29th, 1979. That may have been the end of the strip? Thanks Cliff! I don't suppose we're lucky enough that the 4/29 strip had a farewell message, right? In any case that's the end date until we find out different. The 4/29 strip was about aliens who visit Earth and make fun of Opera. No main characters even appear in this strip. Very odd page. Charles D. Pearson was born in Brooklyn, New York, on May 21, 1913, according to his New York World War II enlistment record. The 1915 New York State Census recorded Pearson, his parents, Milton and Emily, and older brother, Homer, in Brooklyn at 48 Richmond Street. 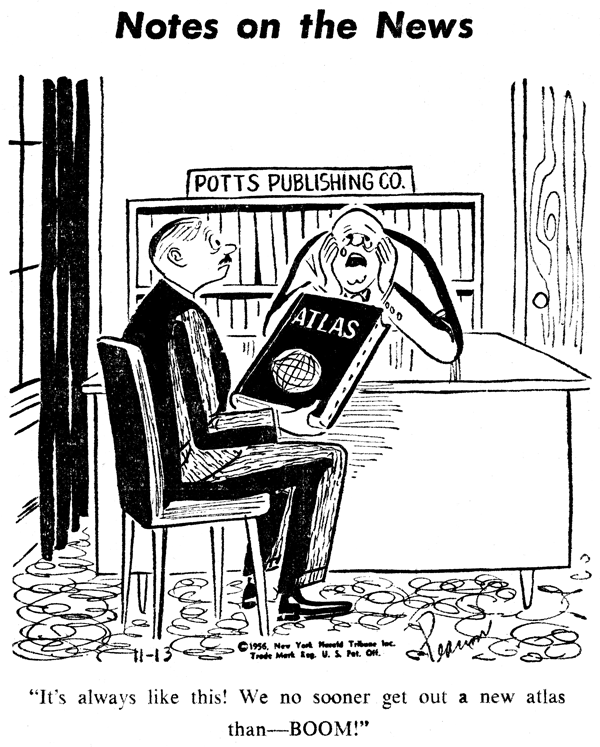 Pearson would reside there long enough to be found in the 1940 U.S. Federal Census. His father was a traveling salesman. The census records at Ancestry.com link his mother to an “Emilie Dahl” in the 1900 census. Pearson’s middle name may have been his mother’s maiden name. …Mr. Pearson was born in Brooklyn about 40 years ago and went to Jamaica High School where he started cartooning. After four years at Grand Central School of Art he began freelancing and made his first sale to the old Life magazine when that publication was devoted to cartoons instead of the news organ it has become since purchased by Time, Inc.
Later sales were made to Saturday Evening Post, Colliers, Ladies Home Journal, and American Legion Magazine among others. In between, there were 36 months in the South Pacific with the Army where he also cartooned and did editorial work for Yank. It was also at this time that he broke his bread and butter arm and was idled from the drawing board for a time. …Editorial page cartoons have long been an important feature of many of the nation’s newspapers and the above have been included among the hundreds turned out in the last few years by Charles Pearson, who now makes his home on a small farm in the Town of Greenport. 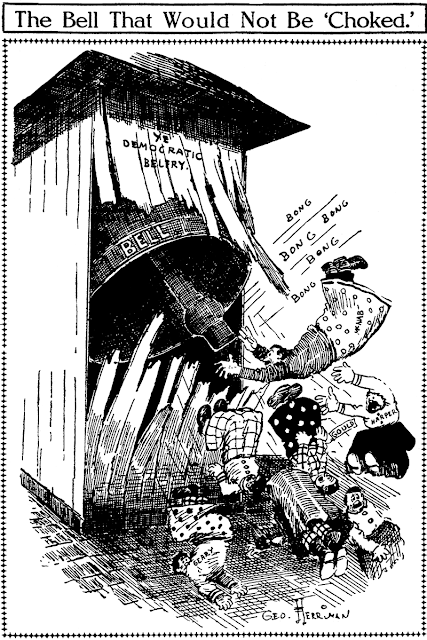 Once weekly Mr. Pearson turns out six small panels entitled “Notes on the News”, devoted to some segment of that week’s happenings and these, in turn, are distributed by the New York Herald Tribune Syndicate to 60 publications including the Oakland Tribune, San Diego Times-Union, New Orleans Times-Picayune, and other large metropolitan dailies throughout the nation. “The cartoons themselves are simple, once I get the idea under way,” Mr. Pearson says, “but the toughest part is writing the caption lines for them. I do all my own captions.” Ideas for cartoons come for the most part from reading the news and retaining what is big enough and important enough that everyone will know about It two weeks or so hence when they see the cartoon on that particular subject. 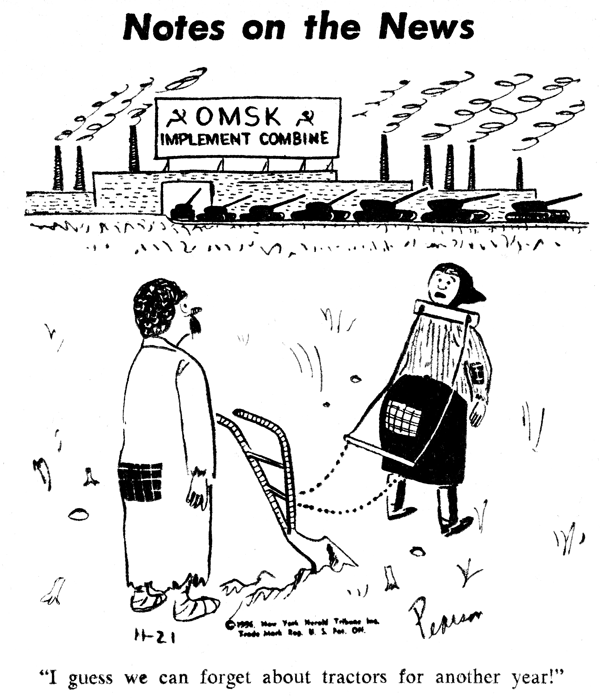 For instance, the recent Sputnik flurry which in turn helped create the panel of the “beeping” Russian. One corner room in the upstairs of his farm home is Mr. Pearson’s studio where he has a drawing desk next to a window that furnishes a view of the Greenport countryside as he contemplates his next cartoon. Within easy reach of the southpaw artist are an assortment of pencils, brushes, inks, paper, and a few newspapers for research. …Last March Mr. Pearson moved from Westbury, L. I., to his present Greenport farm. Mrs. Pearson, originally from Sherman, Texas, is a graduate of Texas State College for Women at Denton, and was a reporter-photographer, for the Marshall News Messenger. She later came to New York City as a fashion photographer and there met her future husband. Their three budding cartoonists, all boys, attend Claverack Union Free School. 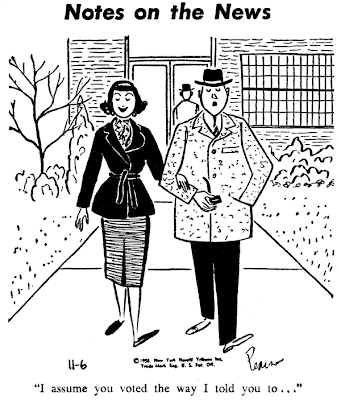 In the late 1940s into the mid-1950s, the Sunday paper magazine, This Week, published his cartoons; a photo of him appeared in the March 2, 1947 and July 31, 1949 issues. 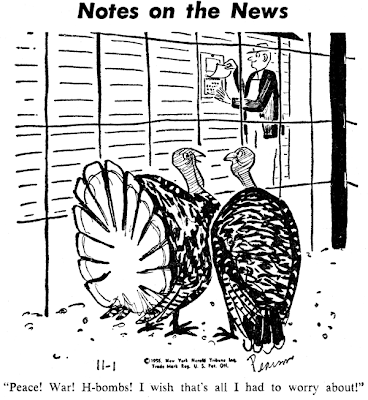 In 1952, his cartoons appeared in the Sunday paper magazine, Parade. 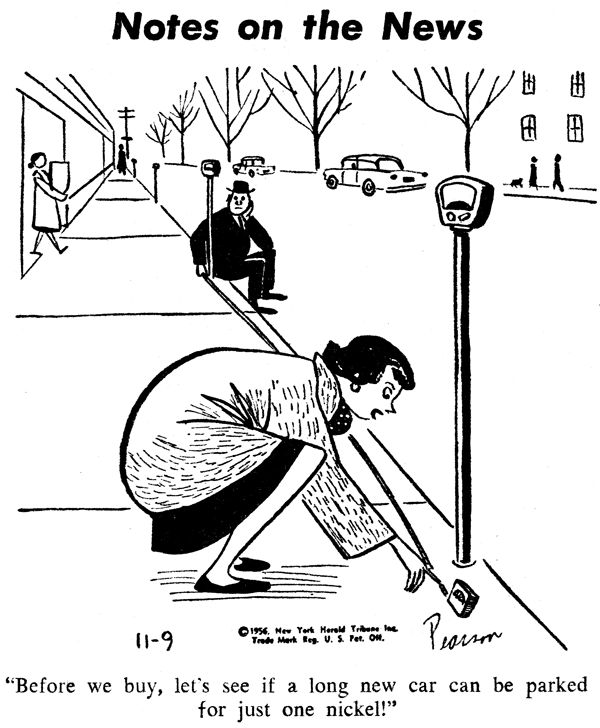 Pearson’s piece about himself was printed in Best Cartoons of the Year 1947. I was born 400 years ago in a life boat aboard the Mayflower. I’ve been drawing cartoons ever since. 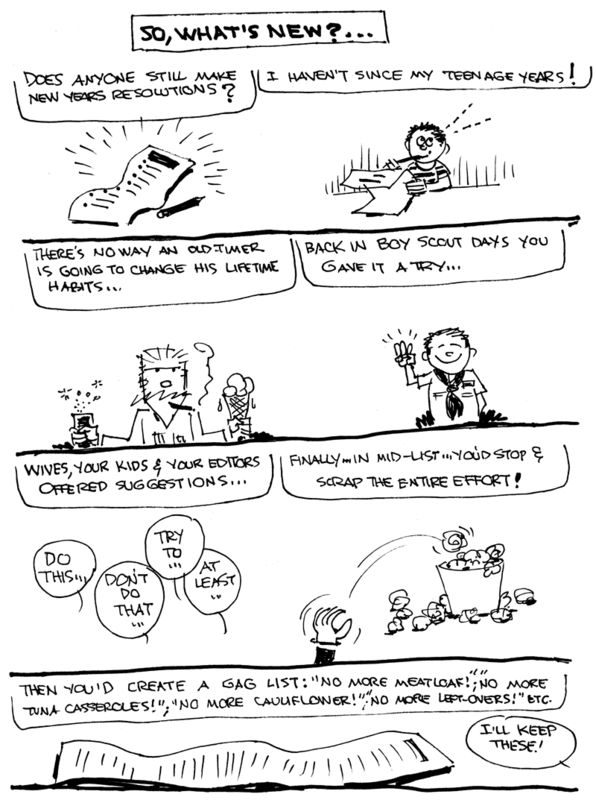 My first cartoons were drawn for a select group of subscribers. Each morning a cartoon was painted on the side of an educated elephant. During the day the elephant walked a route which took him past the home of each subscriber. He stopped in front of each one for three minutes. The elephant disappeared during a meat shortage. I suspected dirty work on the part of a diner that started to advertise ‘Jumbo Hamburgers’. Unfortunately I could never prove anything. Recently I was in Uncle Sam’s Marching and Chowder Club and right now I’m drawing left handed cartoons for magazines until such time as I invent the Elikafoobis. The Elikafoobis will revolutionize conditions here on the Universe. Wait and see. Mr. Pearson’s brother is still not President, though he hopes to make it in 1956. 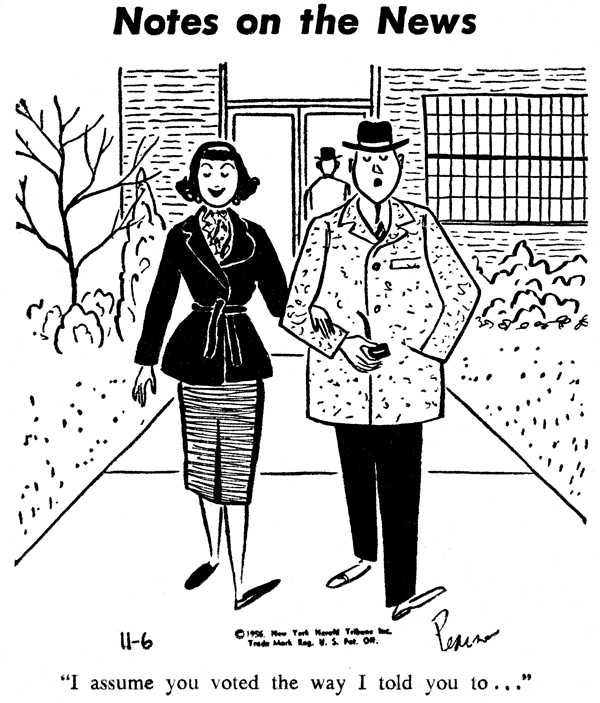 Meanwhile Cartoonist Pearson is keeping his tuxedo pressed for the inaugural dinner, and he and his wife have raised three future presidents of their own. They all live in Carle Place, New York, wherever that is! The editor of the Look humor department, Gurney Williams, has had on display a mousetrap invented by Charles Pearson, a cartoonist of Hudson, New York. It is a large tin can, the open end of which is covered with wire mesh. Bolted partway inside the can is a conventional mousetrap with its lethal snapper securely wired upright to the mesh. It is physically impossible for any mouse to enter this trap, and even more impossible that the immobilized snapper could pose any threat to man or beast…. 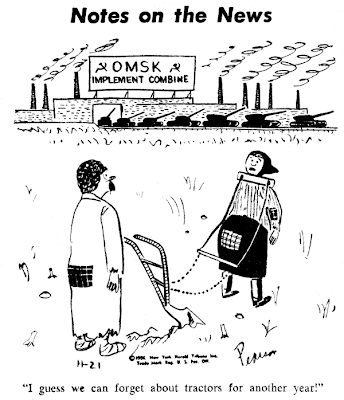 Sometime in the 1960s, Pearson was a cartoonist for the Albany, New York newspaper, the Knickerbocker News. The original art for a few of his cartoons are here and here. ...Work on our cover story (Heroes of the Christmas Bird Count) began in November 1973 when Samuel Yeaton of Bayside, a veteran of many Audubon bird censuses, agreed to write the story of the then upcoming bird-count. His article arrived in our office January 1974. Early in summer Charles D. Pearson of Hudson read the article and consented to prepare illustrations for it including a cover. The resulting combination of pictures and text is, we think, a most happy one. According to the Social Security Death Index, Pearson passed away March 16, 1991, in New York. Sometimes it is hard to tell when a newspaper cartoon about the news should be categorized as editorial, but Charles Pearson's Notes on the News clearly falls on the side of pure entertainment. It appeared as a little breath of fresh air on the op-ed pages of the New York Herald-Tribune for quite a few years. Unfortunately for many of those years it was untitled and I failed to track it as I indexed other material in that paper. What I can say is that it was definitely already there in the early 1950s, and it gained its title around 1955. 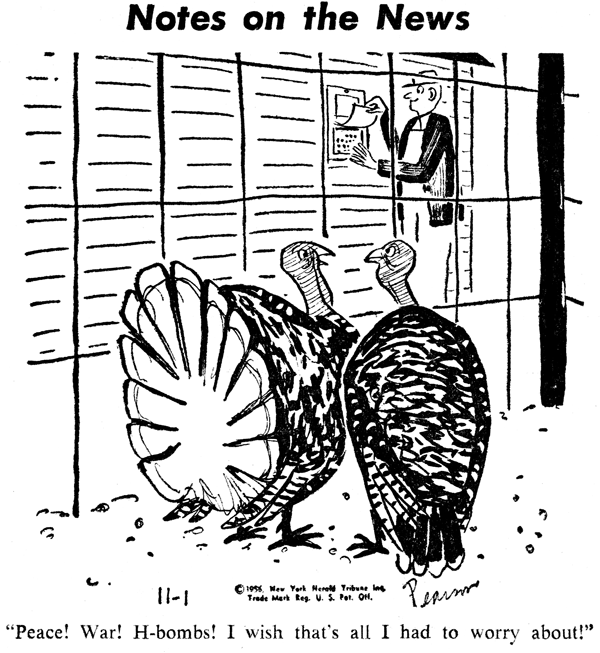 The Herald-Tribune syndicated the panel until 1963, when it was passed on to Publishers Syndicate along with most of H-T's features. That syndicate didn't seem to have a great deal of interest in it, and it was dropped sometime in 1964. However, Charles Pearson then self-syndicated it with at least some modest success, until 1972. I know very little about Pearson. According to this post on OSU's Cartoon Library website, he was a prolific gag cartoonist, appearing in most of the major magazines, and contributed to Yank during the war.